In May, 2014 National Save the Sea Turtle Foundation (NSTSTF) donated $31, 350 to Inwater Research Group (IRG) with the sole purpose of starting an education department. The department would involve local schools and the community in conservation education while bolstering the missions of both organizations. The primary goals were to create tailor-made lesson plans to K-12 teachers as well as offer classroom outreaches. In addition, IRG would attend community outreach events and offer an educational component. All educational offerings funded by this grant are offered to schools and the community at absolutely no cost. Funds were allocated to staff time, materials, and mailing costs. The following is a breakdown of what the funding accomplished. *Title One schools are schools that have a majority of students on the free/reduced lunch list, typically with the most underserved student body. In addition to Florida, the lesson plans were requested in 27 other states and 4 other countries, (China, Egypt, Puerto Rico and Guam). “I presented lesson 1 to a 4th grade group that was SO into this lesson that I cannot even describe it. I have one student with Autism that thought today was the best day of his life! He was so engaged and asked so many questions, I was in my glory! They are all looking forward to another visit soon.” -Mrs. Zavala, Resource Specialist, Hamlin Charter Academy, CA. “So many thanks!! My students loved participating in this project!” Mrs. Betts, 4th grade teacher, Hamlin Charter Academy, CA. 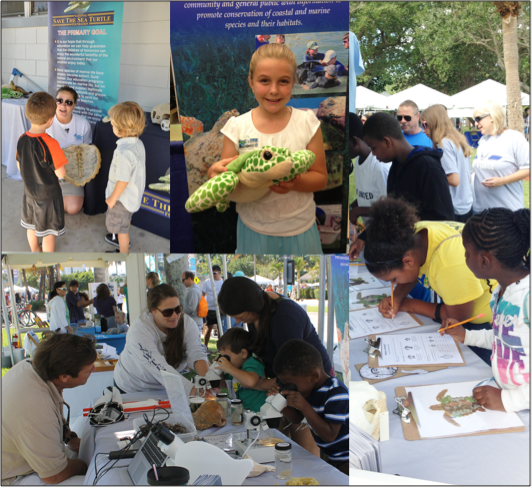 School Outreaches are picking up this spring as Florida schools touch upon Natural and Life Sciences in March/April. To date, there are over 400 students signed up to receive in-class outreach and 1200 students who will learn from our educational program at their science night.